As you’ve probably guessed by now, I love snowboarding. 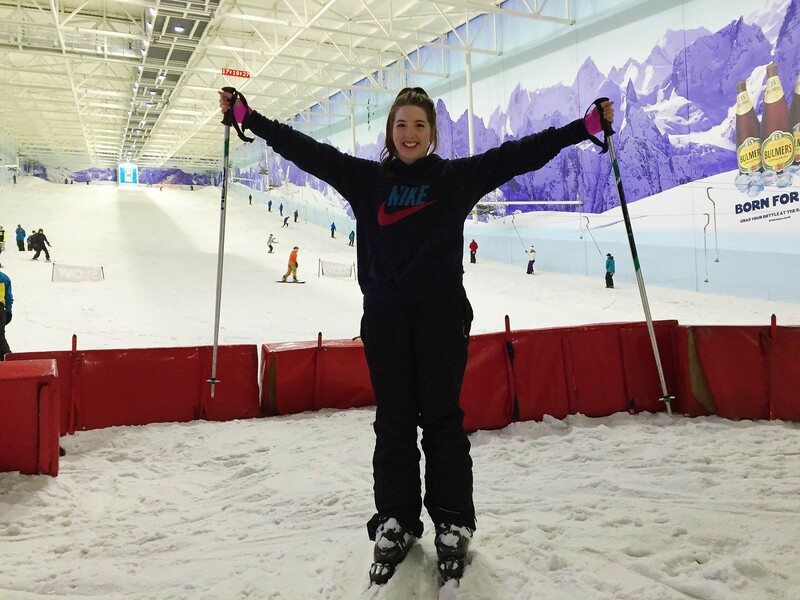 Since I made the switch from skiing and booked onto my very first lesson at Chill Factore whilst at university, I was hooked. I loved the sport, the challenge, the new friends it gave me and the opportunities to travel that came along with it. But on my past two winter trips, I’ve started to pine for skiing more and more. When your boyfriend is a skier, and a good one at that, it can be so difficult to keep up on a snowboard. One year we even brought along walkie talkies for when we inevitably lost each other on a challenging run. 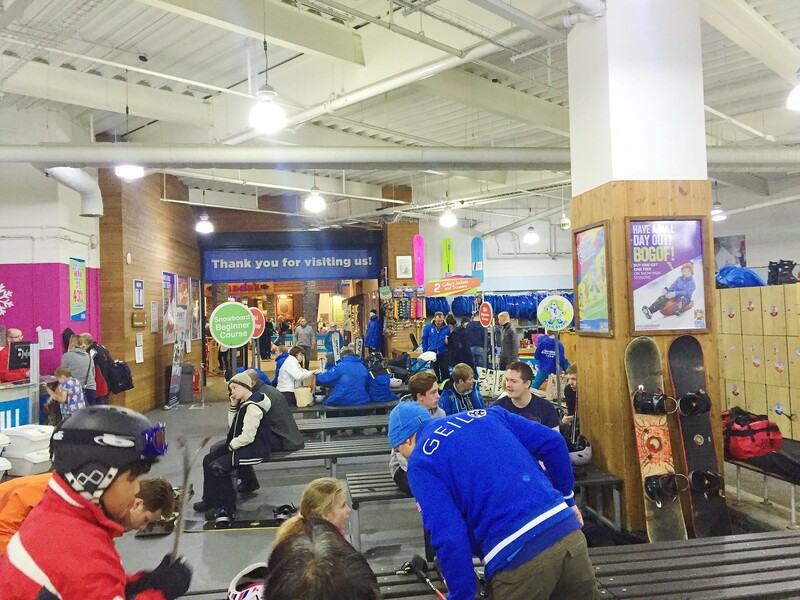 I actually had my first real snow skiing experience at Chill Factore back in 2009, where I completed a three week beginner’s course, but I haven’t touched a pair of skis since. 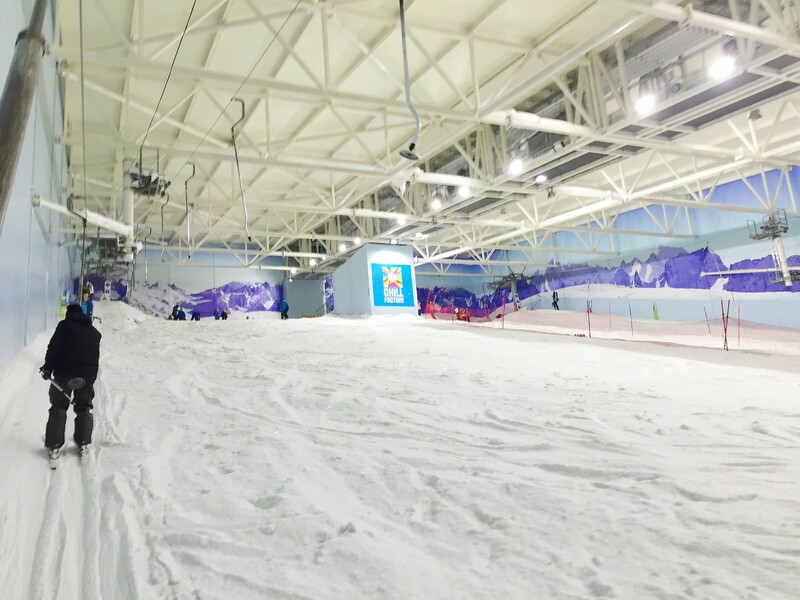 I was way too nervous to just chance hiring some skis on holiday next season, which is why I was thrilled when Chill Factore offered to send me on their Ski Improver Day Lesson for an intensive re-introduction to skiing. 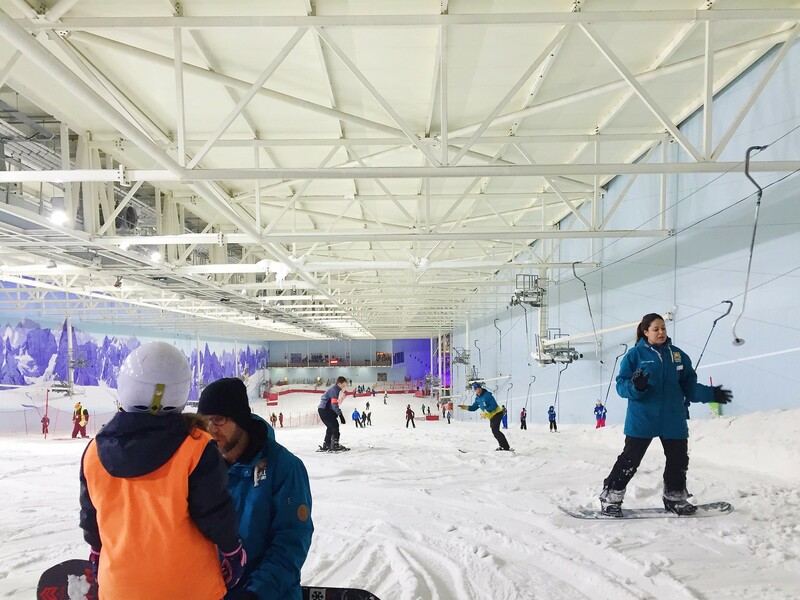 The Ski Improver Day Lesson is an intense day of skiing, with 6 hours of tuition and a max of 10 people per group. It’s perfect for those who have already completed a beginner’s course of lessons or for those who haven’t touched a pair of skis in years (like me!). 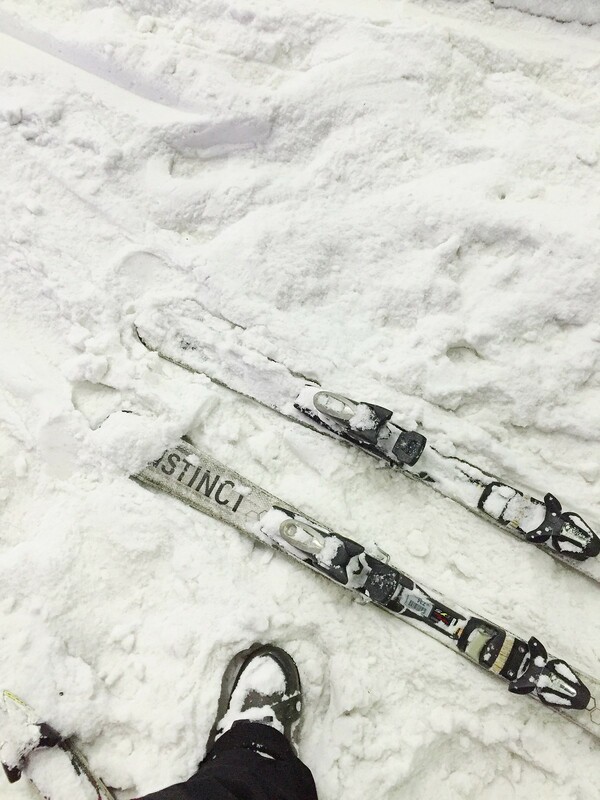 There is the option to split the improver lessons over two consecutive days or even three weeks, but even though a full day can be quite tiring, I definitely think it’s the best way to get back into skiing. Plus, if you’re prepping for a ski holiday, it’ll ease you back into the idea of skiing all day. Grab your skis, ski boots, any hire clothing, pack away your belongings into a locker (don’t forget to bring a £1 coin for this!) and then you’re good to go! I find that the constant exercise warms me up pretty quickly, so I wear a long sleeve thermal top, comfy hoodie, ski gloves, ski socks and my waterproof ski pants. Everyone is different, but for a first timer I would recommend you wear your own warm long sleeve top, either hire or bring your own waterproof ski jacket and definitely wear some thick-ish socks, gloves and ski pants. Our instructor, John, was really experienced and had taught skiing in Austria, America and Italy, so our group of 4 was in really great hands! To get an idea of the people you might be mixed in with, my group had a brother and sister (I think they were in their twenties) and a teenage boy. The girl and the teen had completed the beginner’s day lesson and were keen to build their confidence and perfect their technique a little more and the guy hadn’t skied since his school years and wanted a bit of a refresher. We were a real mixed bag of experiences, but John treated us all as individuals, rather than assuming we could all move at exactly the same pace. First, he got us to do a couple of runs from the bottom half of the main slope to assess our technique and ability. The first run was hands down the worst I’ve ever skied, I had absolutely no idea what I was doing and how to do any type of turning. I actually thought ‘what am I doing here?!’. John wasn’t there to judge though. He gave me a few pointers for my balance and positioning and when I made my way down the slope on my second run, I felt instantly more at ease. The first run is always the hardest, even when you’re a good skier! The morning is broken up with a coffee break and finishes with lunch at Mont Blanc, which consists of a huge pizza that you’ll definitely be ready for after all that skiing! It gave us all the chance to refuel, chat about ski holidays and even do a bit of shopping at Subvert Boardstore (loyal snowboarder til I die!) and Snow+Rock. After lunch, I have to admit, I was bloody knackered. If I was on a ski holiday, without an instructor, I’d probably have started apres a little early! But I wasn’t, so I trooped on and pushed myself! By the afternoon, I was more than confident heading straight to the top of the main slope and really working hard on perfecting my turns and moving into parallel turns when I could. John gave us a couple of fun exercises to try that helped us focus on different aspects of our skiing. So yeah, now I can ski down the slope balancing my ski pole on the tops of my hands… always good to know! The afternoon was truly knackering but our instructor kept us all motivated and challenged, which really helped. Before I knew it, we were getting our last runs in on the very empty slope and it was time to ditch the skis and head home. 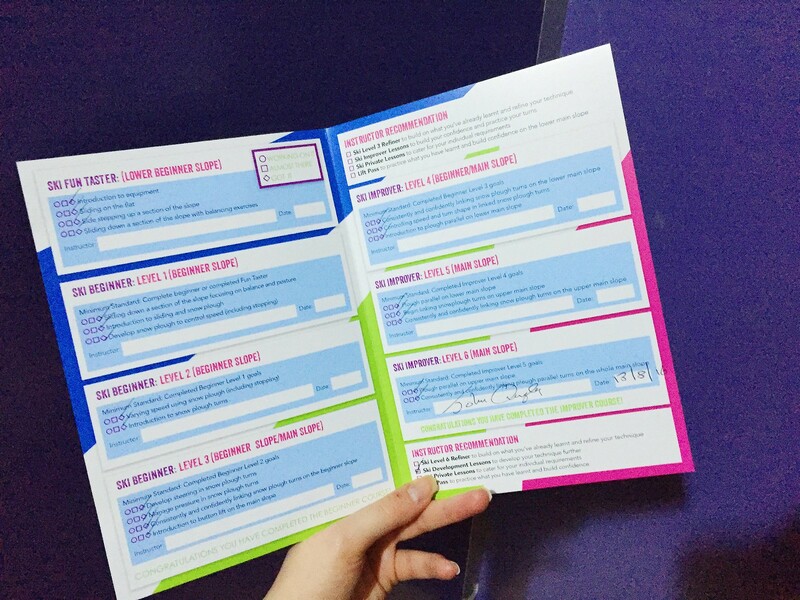 Before that, John filled in our report cards from the lesson, ticking off everything we had managed to achieve. For me, that meant completing up to Level 6, which meant I could plough parallel on the upper main slope and consistently and confidently link plough parralel turns on the whole of the main slope. As much as I missed my snowboard, I left feeling really confident and positive about picking up a set of skis again and perhaps even speeding past Mat on our next holiday! Ok… maybe not, he’s a bit of a speed machine, but at least we won’t be needing the walkie talkies anymore. Huge thank you to John Quigley, my instructor, who was patient, so helpful & friendly and also a mutual fan of St Anton! 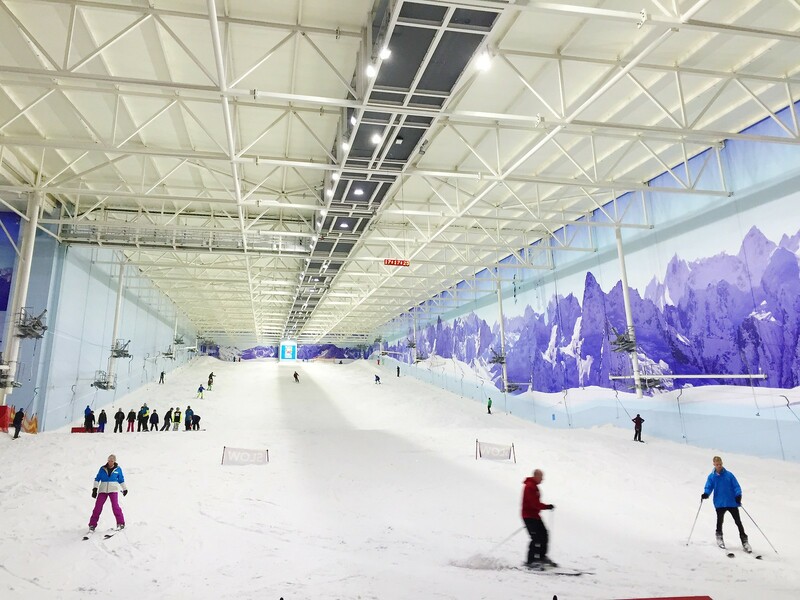 Disclosure: I was provided with a Ski Improver Day Lesson complimentary of Chill Factore for the purpose of this review. 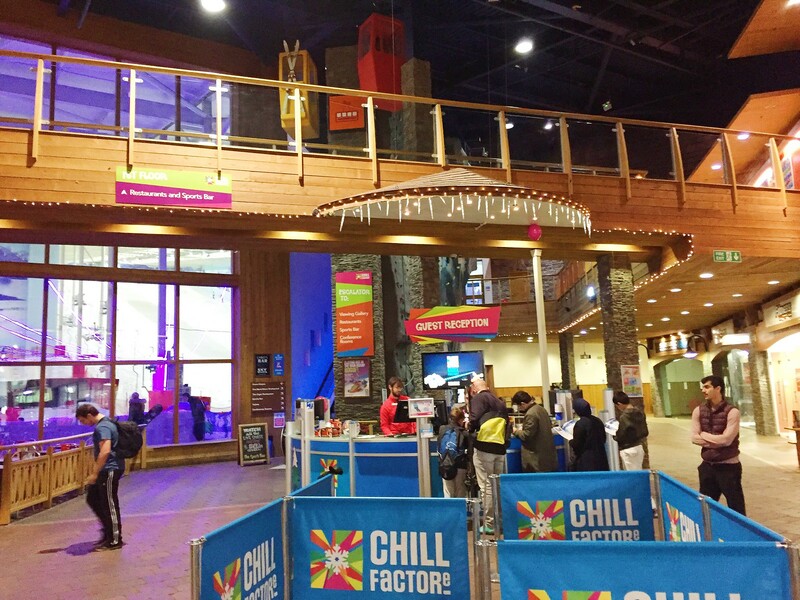 As always, all thoughts & opinions are my very own and as you probably already know, I’m a huge fan of Chill Factore anyway! 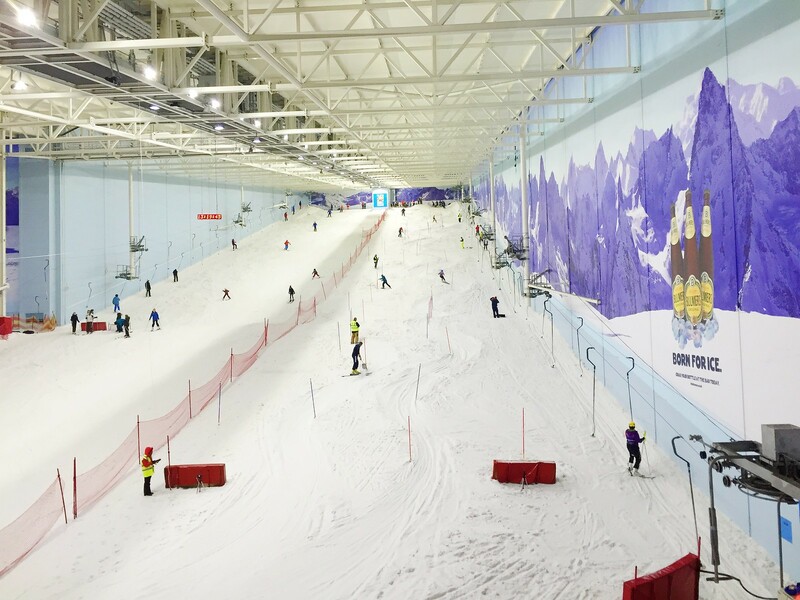 If you’d like to brush up on your ski skills, or even try a beginner’s day course, check out Chill Factore’s website for more details. They’re just off the M60 at Junction 10, near the Trafford Centre, so super easy to get to!